Half of the Multimatic Motorsports Team Panoz driver line-up was confirmed at Sebring today: former Panoz prototype man David Brabham will join Scott Maxwell in the team's No. 50 Panoz Esperante GTLM for the whole, 10-race ALMS schedule. The Esperantes will again run on Pirelli rubber. Pirelli is expected to play an even more significant role in the series this year, particularly in GT1 and GT2. "This already has been a terrific week for us (at the Wheels Down Winter Test)," said Larry Holt, Multimatic vice president and team technical director. "We are pleased with how the car has performed over the first two days, thanks in large part to the support we are getting from Pirelli, who we're thrilled to be working with again for 2006. "Then adding a driver as talented as David gives us even more reason to be thoroughly optimistic for this season," Holt added. "He has a long history of success with the Panoz LMP1 projects, and he's no stranger to Multimatic and Scott (Maxwell), either." 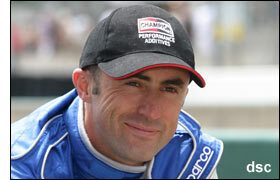 David Brabham has 11 career victories in the ALMS, from 52 starts – with a total of 29 podium finishes. He and Maxwell raced together in a DP, a Multimatic of course, to the class win at Daytona in 2003. "It's fantastic to be back in a Panoz car as some of my fondest racing memories are from the time I spent in the LMP car," said the Australian. So Brabham won’t be a Prodrive driver in 2006 – but who will be? Larry Holt is planning to firm up the remaining Multimatic Panoz drivers for the season, and for Sebring, by the end of this week. He looks to have got the car(s) right – so drivers are next on the job list.